New Breakthrough in Patient Identification: Zebra ZD510-HC Wristband Printer » TPI » Experts in wireless, barcode, RFID and custom software solutions. In healthcare, positive and accurate patient identification is absolutely critical. A single mistake can lead to a dangerous medication mix-up, a treatment error, or even death. It’s also important to positively identify and track patients as quickly and efficiently as possible, so they can get the care they need without unnecessary delays. Fortunately, there’s a simple and highly effective solution to help ensure flawless patient identification: Zebra’s new ZD510-HC healthcare wristband printer. This solution is our top recommendation for healthcare providers because it’s designed specifically for the unique needs of medical environments and is loaded with critical features to ensure positive patient identification, improve patient safety, and simplify HIPAA compliance. First, Zebra’s ZD510-HC printer prints a wide range of Zebra Z-Band wristbands with antimicrobial coating and hand-sanitizer resistance. These features help ensure patient safety and prevent the spread of germs while offering two to six times the durability of other wristbands. In addition to its remarkable flexibility, safety, and durability, the ZD510-HC also prints with exceptional quality, ensuring optimum image durability and first-time scanning, even for narrow barcodes. Zebra’s Z-Band wristbands are available in a wide variety of sizes, from infants to adults, with both adhesive or clip closures for extra safety. Additional options are also available for sensitive skin, and Zebra’s wristbands are even MR safe, so they won’t present additional hazards to patients undergoing MRI procedures. The ZD510-HC’s disinfectant-ready and UV-resistance housing are also a boost for patient safety, as they’re designed to handle regular sanitizing with harsh chemicals and UV light. 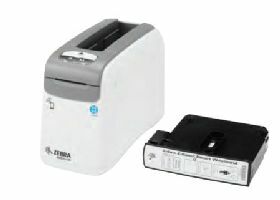 The printer is also the easiest wristband printer to use on the market, with fast-loading wristband cartridges. You can just pop in a cartridge and start printing. Each cartridge also contains a smart chip that allows automatic calibration. With the smart chip, the ZD510-HC instantly identifies the wristband size and automatically configures darkness and speed settings to ensure optimal print quality and maximize wristband durability. It’s also easy to deploy the printer with multiple connectivity options, including Ethernet, USB, USB Host, and Bluetooth LE. There’s also an optional dual wireless radio connection that uses 802.11ac and the latest security protocols, plus Bluetooth 4.1 with concurrent wired and wireless communications. You can quickly pair the ZD510-HC and start printing by using its Print Touch NFC tag that is compatible with NFC-capable mobile devices. From an IT and data security standpoint, Zebra’s ZD510-HC also offers unparalleled integration and protection. The printer is validated for use with leading admission, discharge, and transfer (ADT) systems, including Allscripts, CareFusion, Cerner, CPSI, Epic, and McKesson. Thus, you can easily get up and running using the wristband formats from these solutions. Additionally, the ZD510-HC is powerfully secure. It includes the latest wireless security protocols plus advanced security and management features, such as Zebra’s PrintSecure, an application that makes it easy to configure your printer to use secure connections, block unwanted access, and protect your data and infrastructure. The ZD510-HC also simplifies HIPAA compliance with direct thermal printing, so there are no printer ribbons to secure, incinerate, or shred. To round out the healthcare-focused features of Zebra’s latest wristband printer, the ZD510-HC includes a medical-grade power supply that is IEC 6060-1 compliant for use in medical facilities. With over 20 years of experience in healthcare data capture, we can help you make the right choice for you and your patients. If easy yet accurate patient identification and improved patient safety are priorities in your healthcare facility, we strongly recommend using Zebra’s ZD510-HC wristband printer. To learn more about this product, contact TPI now to get answers to your questions and a free consultation.